The 2012 Wisconsin Fruit and Vegetable Conference, held January 15th to 17th at the Wilderness Resort in the Wisconsin Dells, had a record attendance of 701, according to Anna Maenner, Executive Director of the Wisconsin Winery Association and the Wisconsin Grape Growers Association (WGGA). The Wisconsin Conference is different from other Midwestern wine shows in that the agenda includes various crops other than grapes. Maenner said the attendance for the wine and grape contingent of the show was around 175. 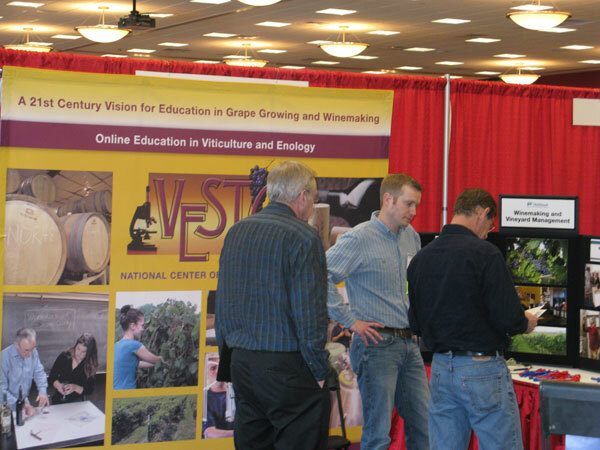 Robert Raatz, VESTA Coordinator at Northeast Wisconsin Technical College, explains wine education programs to Conference attendees. Becky Rochester, Grape Marketing Coordinator, for the Wisconsin Grape Growers Association addresses attendees of the Wisconsin Fruit and Vegetable Conference. 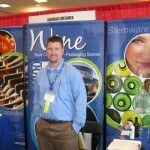 Michael Cronin, Accounts Manager for Kaufman Container in Minneapolis, at the company’s Conference exhibit. 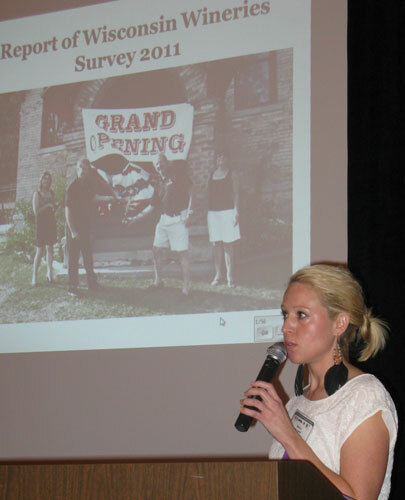 Becky Rochester, Grape Marketing Coordinator of the WGGA, said there are now 90 wineries in Wisconsin according to her 2011 Wisconsin Wine Industry Survey. In 2004, there were 35 wineries in the state. Dean Volenberg, University of Wisconsin Extension Agent for Door County, said that of the 72 counties in Wisconsin, there are only 12 counties currently without a winery or a vineyard. The number of acres of grapes in Wisconsin is subject to debate. Tim Rehbein, University of Wisconsin Extension Agent for Vernon County, said that the USDA reports 480 acres of grapes under cultivation in Wisconsin. However, the 2011 WGGA survey discovered 358 acres of grapes. Rochester said she believes actual vineyard acreage could be as high 750 acres based on her travels throughout the state. Vernon County, between Madison and LaCrosse, had the highest total acreage followed by Dane County which includes the city of Madison. Six new wineries opened in Wisconsin during ’11. 2010 total wine production was over 676,000 gallons, a 6% increase over 2009 and a 17% total increase from 2008 levels. Rochester said Marquette was the varietal that wineries were most interested in purchasing followed by LaCrescent. Two new varietals, Sabrevois and Brianna, moved into the top 12 varieties planted in Wisconsin. Conversely, Seyval Blanc is being pulled out most frequently by growers primarily because of cold hardiness problems. 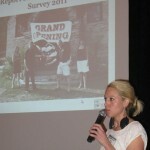 The conference was attended by a number of entrepreneurs considering starting a winery or vineyard. Rehbein said grape growing is profitable in Wisconsin, but new vineyards should expect to spend about $14,000 per acre (including labor costs) before the first harvest in the third year after planting. 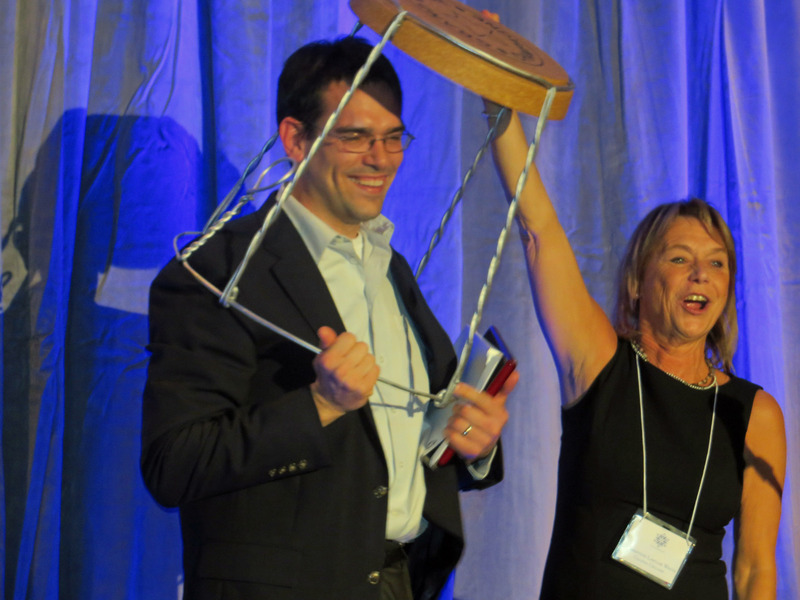 The first Wisconsin Grape Growers Association Awards were announced at the Conference. TIm Rehbein won the Industry Award for major contributions advancing the Wisconsin grape and wine industry. 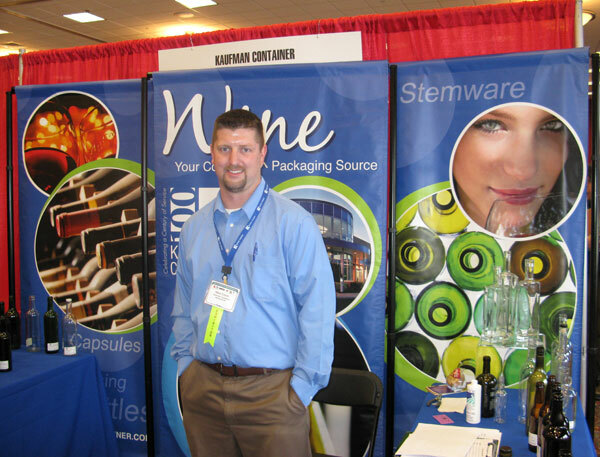 Editors Note: A report on Brad Johnson’s presentation at the Wisconsin Conference, “Engaging Volunteers in a Commercial Enterprise,” appears on the home page of Midwest Wine Press. 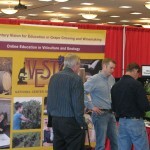 Please see the Wisconsin Grape Growers Association website at http://wigrapes.org/ for more information about the Conference.